Picture 14B-1. Cars 134 and 135 were among the first cars acquired by the infant Illinois Traction System. Built by the Stephenson Car Co. in 1902, they were essentially double truck city cars used in interurban service. At first, they held down the main line runs between Danville and Champaign, but as newer cars were acquired, they were relegated to branch line service. 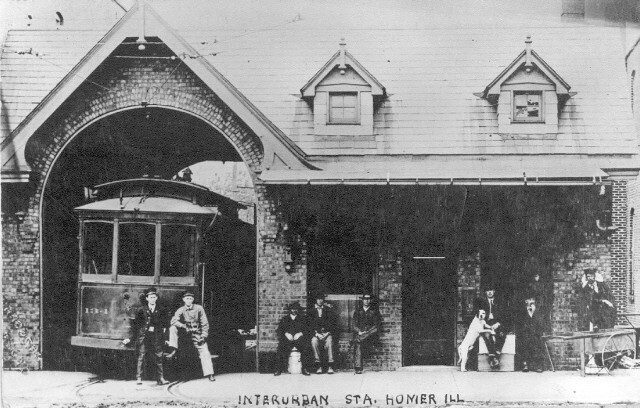 We see car 134 here at the unique Homer depot, at the south end of the Homer-Ogden branch line. Eventually, these two cars were assigned to the Danville city streetcar system.